Air infiltration can represent a major cooling load in Florida's hot and humid climate. 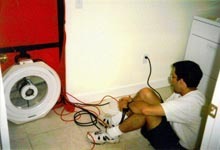 We used a Minneapolis blower door (Figure 23) to measure house tightness in both homes on April 22, 1998. For the Control home the total overall building tightness of the control house was 2,025 CFM50 or 6.3 ACH50 with a house equivalent leak area (ELA) of 95.2 square inches. The overall tightness of the PVRES home was 1587 CFM50 or 4.9 ACH50 with a house ELA of 69.0 square inches. For Central Florida's climate, a useful rule of thumb to determine the house natural air infiltration rate is to divide the house ACH at 50 pascals by 30. This would estimate a typical natural air change rate of about 0.16 ACH in the PVRES home and 0.21 ACH in the Control. In both homes, we noted that much of the leakage to the outside appears to be from the 30 recessed lighting cans in the ceiling. We used a Duct Blaster™ (Figure 24) testing device to determine the relative leakage in the return and supply sides of the duct systems in both homes. 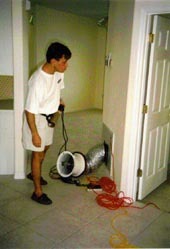 In the Control home, the total CFM25 leakage of the duct system to outside the conditioned space was 122 CFM25. Given its 2,425 square feet of conditioned area, the duct leakage to outside is 0.05 cfm/ft2. This compares to the 0.03 cfm/ft2 proposed as a standard for utility new homes programs. In the PVRES home, the total CFM25 leakage of the duct system from outside the conditioned space was 50 CFM25 or about 0.021 cfm/ft2 - a low value. In summary, we found that the tightness of the duct system of the Control home was very average relative to most homes which we have tested. One limitation of the test, however, is that with the air handler operating, all the leaks are not the same. Ceiling penetrations close by the air handler can bring air from the attic -- air that is super heated in the Control home. Moreover, any of the 50 cfm air that is unintentionally drawn from the attic is being taken from a space that typically gets no hotter than the outside ambient air temperature. The PVRES home, with its interior duct system, on the other hand, had as low a leakage to the outside of the building of any that have been tested by FSEC. Evidence of unintended air leakage in the Control home from the attic to the air handler casework in its interior closet was clearly seen in infrared thermography on the air handler (Figure 25). This is contrasted by the lack of such leakage with the interior duct system in the air handler case itself suggests that ceiling penetrations by the air handler closest will lead to air being drawn from the space. It also suggests the great hazard of allowing air handlers to be located within attic spaces. Figure 25. 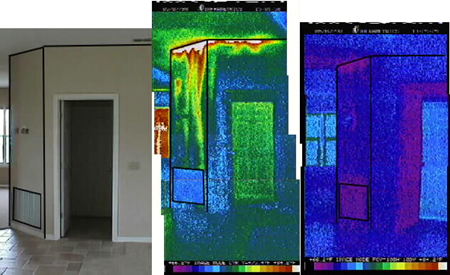 Comparative thermographs of air being drawn from the attic to the air handler in the Control house (center). The interior duct system in the PVRES house shows no problem of this type. Our test results indicate a fairly tight building envelope for both homes, with the PVRES home somewhat better. However, the leakage duct systems for the two homes show large differences, mainly due to interior duct system in the PVRES site. Moreover, thermography showed that the leakage from the attic to the air handler at the Control site has disproportionate impact on cooling efficiency. To supplement the blower door test, we evaluated the in situ air infiltration rate in both homes using sulfur hexafluoride (SF6) tracer gas decay. The blower door indicated that the PVRES home was tighter with less leakage area, but how the tightness will impact actual air leakage rates is strongly influeanced by the operating pressures within the building, particularly when the mechanical air distribution system is operating. Both homes were evaluated on May 20, 1998 with the air handler on and off. The tracer gas concentration decay was measured by two Bruel & Kjaer Model 1302 multi-gas monitors over a one hour period subsequent to SF6 injection. The air handler off test provides information on the "natural air infiltration rate" from air leakage driven by temperature differences and wind on the external building envelope. The air handler on test shows how operation of the mechanical air handler equipment can impact the overall building leakage rate in air changes per hour. Past studies have shown that operation of the air handler will typically increase building air leakage rates by two to three time the "natural" rate which is typically low in Florida homes due to the small driving forces (bouyancy and wind) . However, we would expect the interior duct system in the PVRES home to somewhat reduce the relative impact. The PVRES home evidenced tighter construction in all cases the air change rates were low. The natural infiltration rates (air handler off) were 0.085 and 0.131 ACH in the PVRES and Control homes respectively. The air change rates with the air handler operating was 0.131 in the PVRES and 0.349 in the Control revealing that the air handler operation increased building air leakage by 54% and 266% respectively. It is important to note that in all the cases the building ventilation rate was low relative to the recommended rates within ASHRAE standard 62-1989 of 0.35 ACH . However, it cannot be argued that the higher infiltration rates for the Control home are better, since much of the infiltration air is coming from an undesirable location (the hot attic). The data do suggest, however, that some system of mechanical ventialtion with heat and enthalpy recovery may be desirable for future homes of this type.